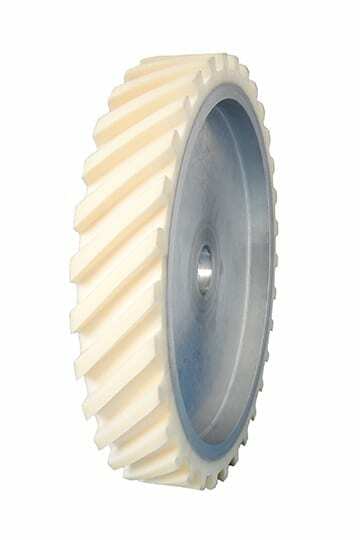 The contact wheel FAPI-VU MILLED is the addition to the smooth model. This is accomplished by milling grooves into the coating of lamellae of foamed up Vulkollan®. The overall height of the coating is also adapted to the respective application and is therefore variable. The grooves can be cut into the coating in various widths, depths and angles. The grooves make the milled contact wheels significantly more aggressive than the smooth contact wheels. The contact wheel’s aggressiveness can be optimised for every application with the groove width-groove depth-web width-relationship to make high performance possible. Also for this contact wheel, there is no fatiguing after long intensive use when used correctly. The contact wheels of the FAPI-VU – series are only coated with a lamellae of foamed up Vulkollan®. Lamellea of foamed up Vulkollan® is cellular Vulkollan®, a polyurethane foamed with water which has very high dynamic properties. Lamellae of foamed up Vulkollan® can be identified by its slightly yellowish colour. 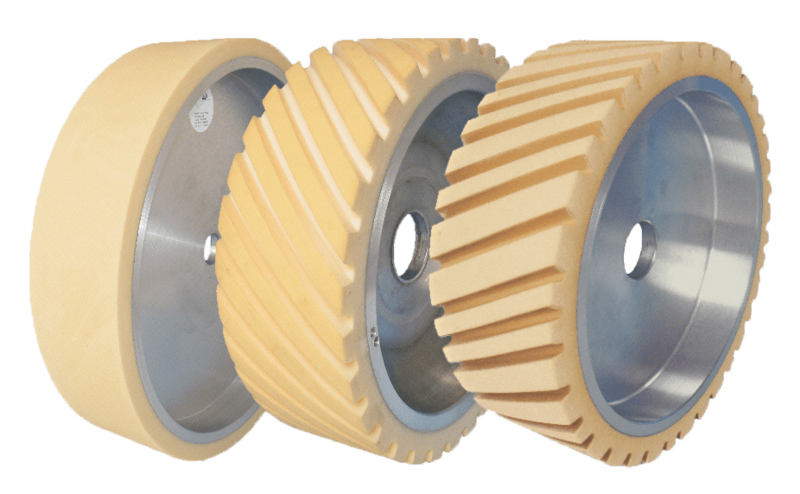 Because of these outstanding properties, contact wheels of the FAPI-VU – series have proven themselves in the market over decades. Contact wheels of the FAPI-VU MILLED are especially suitable for achieving a fine finish on (heavily) rounded and profiled parts. In addition, there is almost no fatiguing of the contact wheel when used correctly, even after long and intensive use. The hardness of the lamellae of foamed up Vulkollan® coating can be differentiated into three levels. The spectrum extends here from a soft coating of lamellae of foamed up Vulkollan® with 25º shore (A) to a hard coating of lamellae of foamed up Vulkollan® with 45º shore (A). The right contact wheels hardness always depends on the individual application.